Grant Park Grocery and Market, NE 33rd and Knott, about 1933. Photo courtesy of Jerry Hoffelner. 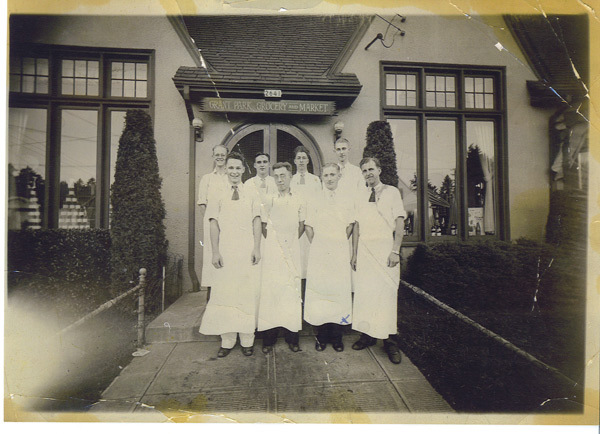 The man in the first row, second from the right with the blue “x” penned onto his apron, is Jerry’s dad, George Hoffelner. The other men have yet to be identified. Can you help? I’m researching a very old house near 29th and Knott. One of the many people who lived in the house over the years worked for a while at the Grant Park Grocery and Market, which we know today as the Family Medical Group office on the southwest corner of NE 33rd and Knott. The image above, taken about 1933, shows the grocery staff decked out in their white aprons ready for action. Like many small stores, these guys often delivered the groceries direct to your door…an idea recently picked up on by some of the modern mega-grocery stores. This image is taken on the east face of the building (facing 33rd). The original entrance for the market was not on the diagonal at the corner like it is today, though it seems there was always an entry there. My hunch is that was the entry to the pharmacy and fountain that used to be there. The grocery business was owned and operated by Ernest Bjorklund. Next time you are stopped at the light there, have a good look at this interesting building and tip your hat to Mr. Bjorklund and his squad of helpful grocery clerks. I’m looking for any help with memories, stories, photos or information about either the Grant Park Market or the pharmacy and fountain. Here’s a shot of that same spot today. The door appears to be an “emergency exit” today. The graceful lights are gone, as is the cool curved doorway and the sidewalk ramp leading to the door (it’s now just part of the garden bed). I’ve just had a book about the history of the Woodlawn Neighborhood published! What’s the chances that two carpool buddies should both be into neighborhood histories! Hey Emily!! It’s Phil from your neighborhood. I’ve contacted Molly via FB a few times. Send me an email please. Spence Lightfoot as I recall ran the Market. And I think Mr. Killian ran the Pharmacy. I remember the store well. My dad worked part time there at one time in the early 50’s. The owners name was Spencer Lightfoot, a native of Oklahoma but everyone called him Spence. We had a charge account at the store so I used to ride my bike to the store often to get things for my mother. The big event of the year would be when Spence would drive back to Oklahoma each year and bring back a truckload of watermelons. The building was originally separated into three sections. Facing the building from 33rd. there were three entrances. The south entrance was to the butcher shop, the middle entrance was the grocery store and the north angled entrance was the drug store. By the time I can remember from the mid 50″s on the south entrance had been closed and the area had been taken by the grocery store and the butcher section had been moved to the rear of the store on the north side of the rear entrance door. The drugstore was a separate business only accessible by the angled door. It was a drugstore out of the movies, about 2\3rds of the south wall was taken up by the old fashioned soda fountain with it’s mirrored back wall. We ordered cokes, cherry cokes, green rivers, root beer floats and any other fountain delight you cannot even dream of getting nowadays.The west wall was taken up by the pharmacy counter which was the domain of an old pharmacist who was at least 90 years old. The north wall and the space between and he fountain were taken up by shelving which had all the usual items carried in a drug store. To the left of the door was the magazine rack which had plenty of comic books which all the kids would hang out. In the early 60’s the old pharmacist died and the pharmacy was sold and remodeled. My dad said they found a bunch of pharmaceuticals that dated all the way back to Civil War times which were donated as artifacts to what is now OHSU. Unfortunately when the pharmacy was remodeled the soda fountain was taken out and a doorway was opened up between the pharmacy and the store near the east end of the produce case which was on the north wall of the store. I still used to stop in the store when I was going to Grant High School as it was on my way home. A couple of years after graduation(1969) I moved out from home and I can’t remember ever going back to the store. I spent a lot of time there when I was kid and have fond memories of the pace, the kind of place I feel we need nowadays can never be again. The place where all the people working there knew you, your name, your parents, where you lived and most of all cared about you. Hi Emily, I remember you and your sister Molly well. Your older brother whose name escapes me used to drive the old Ford. You lived in the biggest house on the block, right smack in the middle of the block on the double lot surrounded by that 6 ft tall laurel hedge. I am the kid who lived on the corner of 31st & Siskyou. I hope I have not bored anyone. Greg…if you get this reply, please contact me. I’m Phil M. from your neighborhood, friends of Rick L. and Tom W. If you get this, let me know and I’ll get you more contact info. I now live in Tucson, Arizona, but Portland will always be ‘home’. Yes, I remember you and all the the other neighborhood kids well. The old neighborhood doesn’t look too much different today. I now live 34 blocks east and one block south of where I grew up. I did not go far. Anyway I will post my junk email acct and will monitor it for a reply from you. It is mikado282loco@yahoo.com. In the 70’s, the pharmacy next door to the market was owned by the pharmacist, Carl Killian. My mother worked there as a cashier until my family moved away in 1979. I remember the magazine/comic book rack that was at the front of the store. I also remember the candy display that was next to the cash register at the back of the store. The most expensive candy at the time was 25 cents. I was too small to see over the high pharmacy counter, so I remember waiting for my prescriptions behind the counter while Mr. Killian filled them (I was on a penicillin and Benadryl regimen for years). Sometime during that decade, I recall that the drugstore was robbed. Mr. Killian was there by himself and was injured by the perpetrators. I don’t remember if they were ever caught. My sister and I used to call the building that the market and pharmacy were housed in “the green store.” That was the exterior color at the time. I remember Mr. Killam and the Grant Park Pharmacy well, though by the 70’s we’d moved to the west side of town. When I was very young I lived at 26th & Thompson. My Fathers dental practice was diagonally across the street. I can remember Mr. Killams face as I type this.I did not know he was injured in a robbery. I also remember well the Market next door. My Sister and I would ride our bikes there on a hot Summer day to buy Popsickles with our “allowance”, then pedaling across the street to Grant Park to play on the swings and slide. I believe the pharmacist Fred Peterson is the man who defeated Dorothy McCullough Lee for Portland mayor in 1952. He was a one-termer…beaten by Terry Schrunk in 1956.